Since 2009, the U.S. has seen a 45 percent increase in pedestrian deaths. In the last year, motorists took the lives of some 6,000 people who were just trying to walk from A to B. While this was happening, government officials acted like they weren’t sure what was causing it. But thanks to an investigation by the Detroit Free Press and USA Today we now know the popularity of SUVs is the most likely explanation. The National Highway Traffic Safety Administration — the federal agency responsible for auto safety standards — has known since at least 2015 that SUVs, because of how they’re designed, were two to three times more likely to kill pedestrians than cars. But the agency has “done little to reduce deaths or publicize the danger,” the newspapers reported, even as the number of SUVs on the road has exploded. 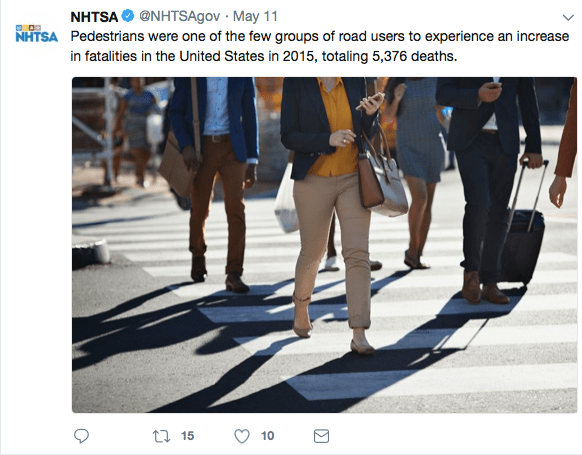 While NHTSA feigned ignorance as to why drivers were killing more pedestrians, it blamed victims for injuries and deaths. 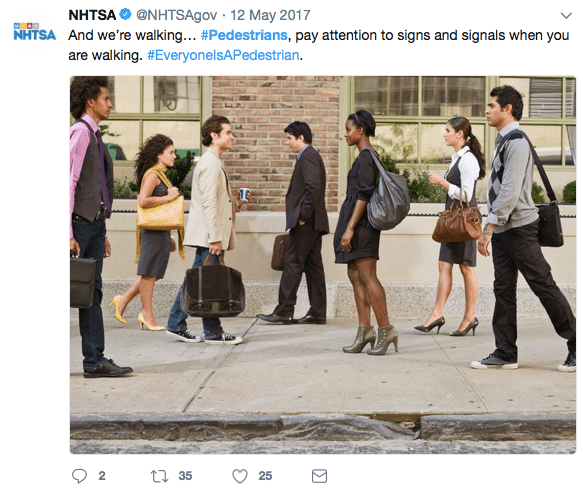 Below are six examples of the NHTSA using Twitter to blame deceased pedestrians since 2015. 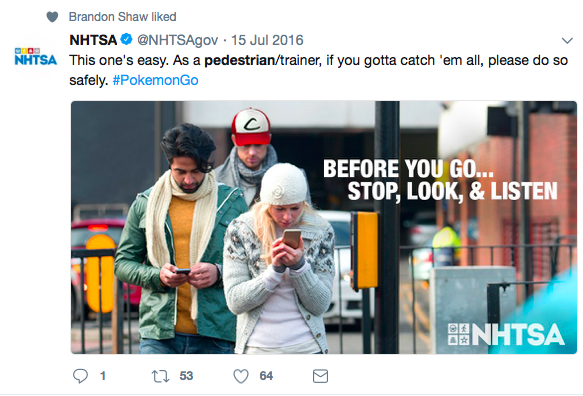 Why mandate safe vehicles and street designs when you can blame Pokemon Go? (Not pictured: all the motorists out of frame playing Pokemon Go.) 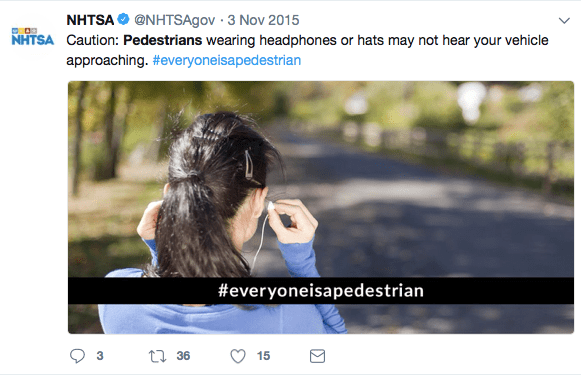 And here’s NHTSA alerting drivers to daredevils out there who might be listening to music (since motorists themselves are known to abstain) or … wearing hats: The above tweet is one example of NHTSA messaging to operators of multi-ton vehicles. 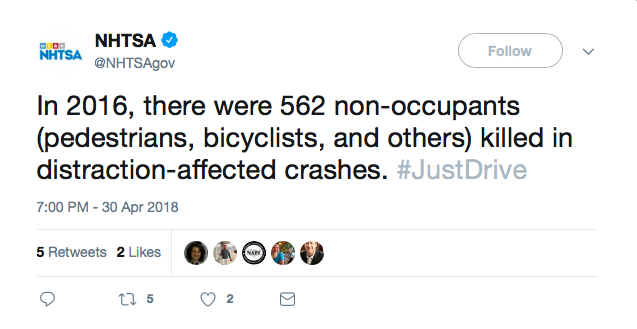 And there was a lot of helmet advice for cyclists — because, again, it’s easier to lecture than to provide safe biking environments. 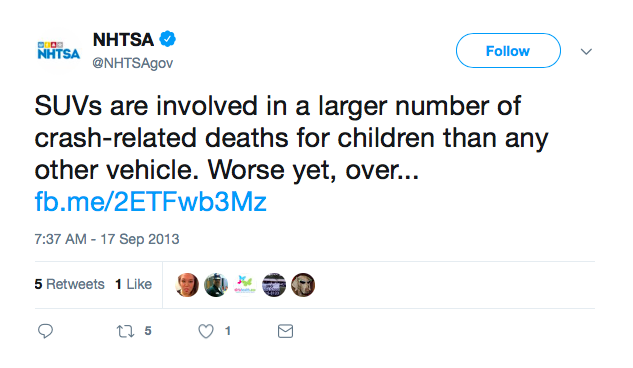 But over this period, there was just one tweet that mentioned the unique risks posed by SUVs. 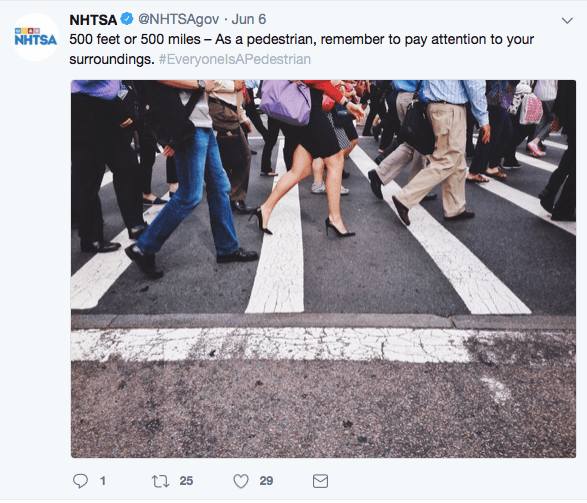 It linked to a Facebook post that has since been deleted: Since the public now knows that larger vehicles are driving up fatality numbers, will NHTSA change its tune? All distracted mobility isn’t created equal. A distracted pedestrian may walk into a traffic signal or another person, but their inattention is hardly ever fatal to other people. A distracted driver can easily kill several people just by glancing at a txt. It’s surprising NHTSA ignores this difference. I recently saw a driver typing on their ipad while talking on a cell driving about 35 in a 25. Traffic calming and human scaled urban design mean nothing if driver behavior continues to decline. 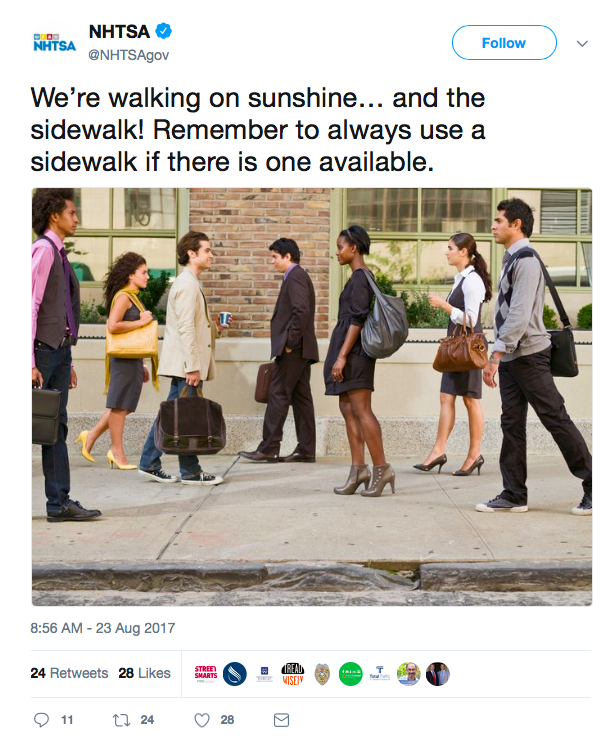 I understand that this is sort of victim blaming, but there have been too many times when i’m riding my bike, and a distracted person on their phone will start walking into the road since they don’t see any cars. I’d ring my bell, i’d yell loudly and forcefully but too often they’re also wearing noise cancelling headphones. I grab my brakes and try to avoid a collision but if I swerve the wrong way, i put my own life in danger if theres a car bearing down on me. If i swerve the other way I might just end up hitting the oblivious pedestrian. This happens on almost a daily basis. Just look up when crossing the streets, we’re all responsible for our own safety out there. Why………is there no study? What is it about SUV’s? Is it just numbers? 40 years ago an SUV was basically a truck body with car/camper combo in one unit. Unlike campers that people put on pick up trucks. And they were niche vehicles. Today an SUV is a 1980’s station wagon that is usually higher off the ground and has bigger truck like tires. My “SUV” is pretty much a wagon version of an entry level honda sedan that is higher off the ground and has AWD to make is safer in the rain and snow. Although the newest SUV’s they are lower to the ground like the station wagons of my youth. More vehicles classified as SUV’s and they are higher off the ground. Ironically, the trend towards taller cars was fueled by the ECE (EU equivalent of NHTSA)’s attempt at mandating pedestrian safety, fulfillment of which demanded a higher, bullnosed front end in order to leave an airgap between the hood and the top of the engine. This in turn led to a higher driving position to allow the driver to see over the taller hood. What is also frustrating is that the manufacturers put the better options like fuel efficient engines or AWD into their SUVs, not their sedans. Toyota and Honda: you can’t get AWD on a sedan, but you can on the SUVs. Volvo: the plug-in electric/hybrid engine only available on the SUVs, not the sedans. While there are more SUVs today than 40 years ago, cars 40 years ago were much larger on-average. 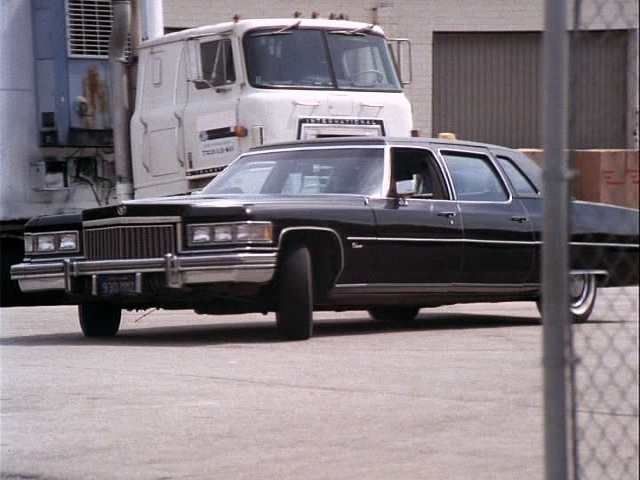 For-instance, the 1975 Cadillac Fleetwood weighed 7200 lbs and had a 500 cubic inch V-8 (8.2 liters). The 1972 Chevy Impala had a 350 V-8 stock, room for 6 adults and all their luggage, and would hold 8 adults in a pinch. The 1972 Chrysler Town & Country station wagon was over 6000 lbs and had a 360 V-8 stock, with an upgrade 440 4 bbl engine that got no more than 8 mpg. Even a good high school friend had a 1969 Lincoln Town Car with suicide doors that weighed 6500 lbs when he was 16 and 17. If you get hit by any of the cars above after forgetting to look both ways while jaywalking you are going to be just as dead as if an SUV hits you today. Now think back to the good old days of cars. Willys Jeep and Ford made a total of 640,000 4WD MB model Jeeps just during World War II, which was well after several US car companies had begun making pickup trucks. 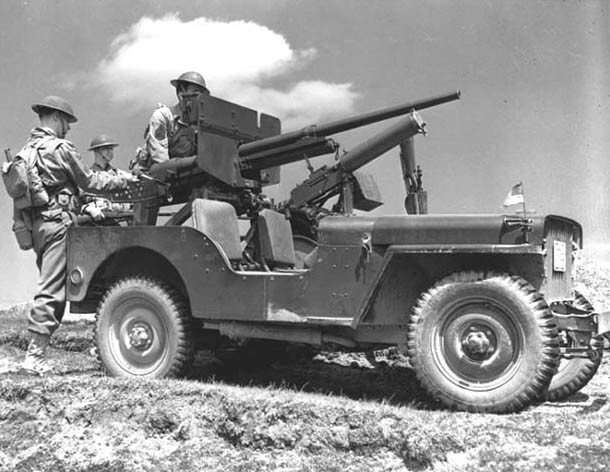 Here is a photo of one of Willys MB Jeep models. Now before World War II cars themselves were much-taller. 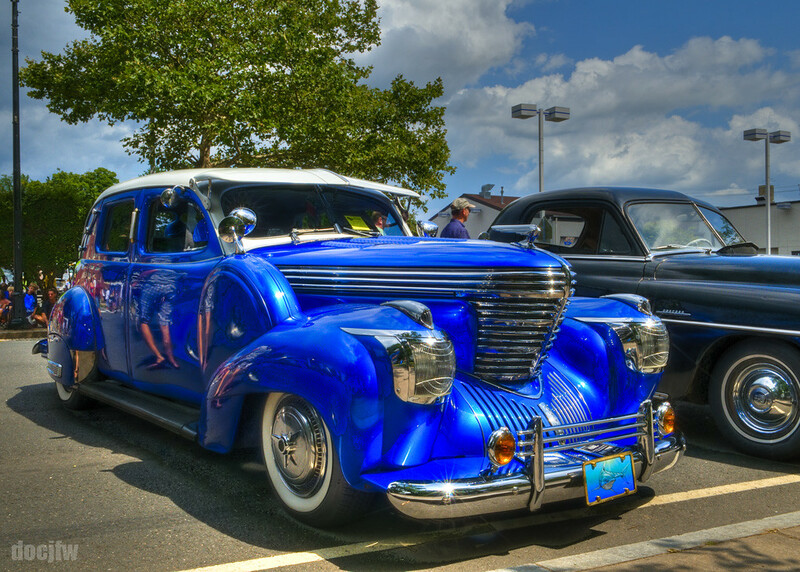 What happens if you get hit by this 1938 Graham Hollywood low-rider while crossing the street? If you don’t get killed its owner will probably beat you to death for failing to look both ways. SUVs were a niche market when? Before World War II, as after World war II Willys continued building Jeeps and even other models like the Waggoner and the Comanche, for all the returning servicemen and others who wanted 4WD vehicles to use offroad. There were also plenty of competitors for that niche market at one time too, like the International Scout for-instance, or the Chevy Blazer, which used to be a full-size vehicle back in the good old days. Crew-cab pick-up trucks date to the 1960s at-least too. What happens if you get hit by this 1970 Chevy Blazer? You may go under the front bumper rather than into the windshield. What kind of SUV is this as it is more than 40 years old? What year pickup is this and who made it? 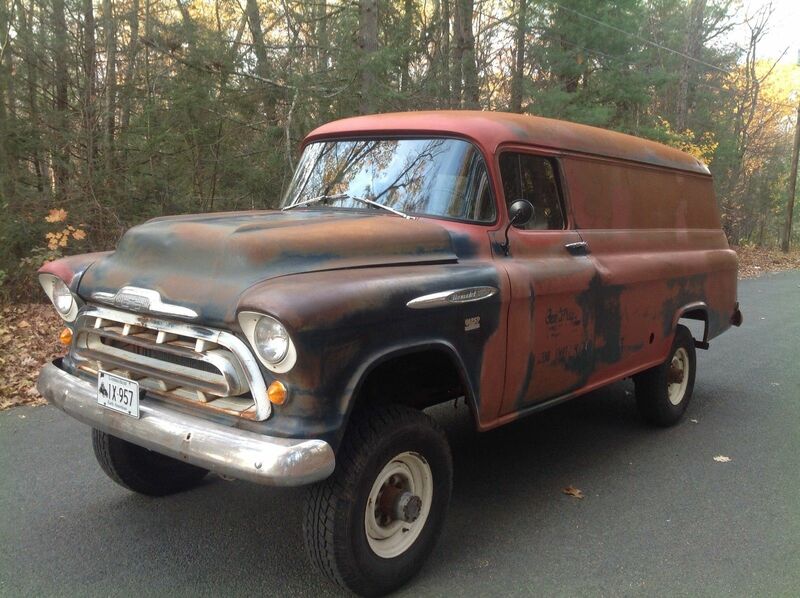 What about any of those 1960s-era full-size vans? What happens if you get hit by one of these 1950s models crossing the street? As I have alluded-to previously there were plenty of 4WD pickups, 4WD Jeeps, Comanches, Scouts, Blazers, crew-cab pickups made by at-least 6 different US manufacturers, full-size vans, and even panel trucks made in the 1950s, 1960s, and 1970s in parts of the US where they were used by farmers and off-road enthusiasts. What, you never never saw any of these in your city? They were quite common in Denver back in the day, in-fact sometimes you will still see some of these early SUVs and trucks on the road today too, though about the only Graham Hollywoods or Huppmobile Skylarks you will see today are in museums. So my suggestion if you are thinking of jaywalking is to look both ways for any small cars to walk out in front of as if you walk out in front of this thing it is going to hurt but good if it hits you. 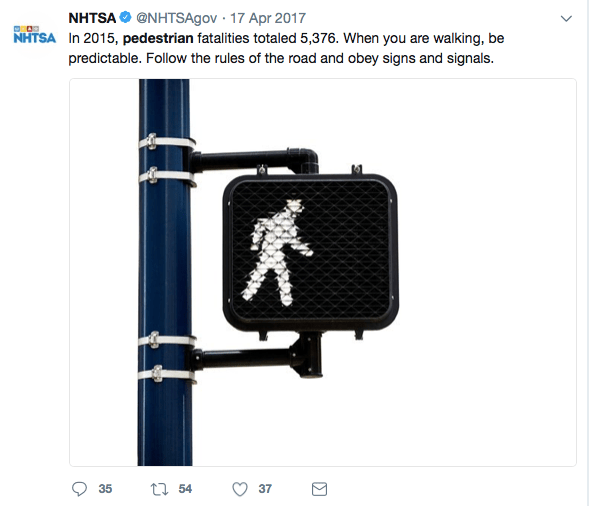 Just to point out that seeing 5984 pedestrians killed in 2017 is a much lower fatality rate than seeing 8070 pedestrians killed in 1980, as the US population last year was 325.7 million and in 1980 was only 226.5 million. Here is a good chart that shows what the likely problem is. US VMT is skyrocketing.